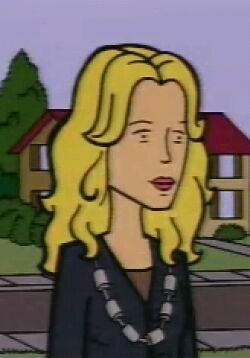 Rita Barksdale is Helen Morgendorffer's older sister. (For purposes here, her maiden name is used, as her current name in the show was never revealed. It is known she was married to a man named Chambers once, but they divorced.) The ages of the various Barksdale sisters—Rita, Helen, and Amy—remained a mystery until resolved in two interviews with show creator Glenn Eichler, in March 2005. Rita is the oldest, Helen is next, and Amy is the youngest. The mother of one daughter, Erin, Rita has had a long succession of boyfriends and possibly husbands. She's infamous for picking some really dodgy ones, like a man named Bruno who was in a "federal facility" for an unmentioned crime, and annoying men like Paul Meyerson. One boyfriend, Roger, was killed in a skydiving accident, but in "I Don't" she showed no reaction to tasteless jokes being made about his demise. In the MTV flipbook "It Takes Two to Tangle" , it was written that she went out with Meyerson because he was so dull and pathetic, in reaction to the more adventurous Brian being killed - "her previous boyfriend was killed in a drop; she overcompensated by dating a drip." In "I Don't", Rita asks Helen if "I should be punished forever because I made a few bad decisions?" This may or may not refer to her love life. Erin snaps at Rita over her then-boyfriend. She dotes on her daughter Erin, though she detests her husband Brian Danielson. When her daughter was getting divorced, Rita wanted to her to get a devastating settlement from Brian. Rita has said she didn't work because raising Erin was more important; however, she referred to that in the present tense as if Erin was still a dependent, even though Erin was twenty four and had a job of her own. Erin, in "I Don't", at one point expresses irritation with her mother over her "pathetic boyfriend making a scene," sounding like this is a long-running point of contention with Erin; Rita is notably upset to hear this. We know Rita doesn't work, and Helen says that employment has never been her strong suit. Her source of income is not said, but it's implied that both she and Erin get quite a bit from her mother: Grandma Barksdale covered Erin's wedding, paid for Rita's new living room ("A Tree Grows in Lawndale") and sent Erin (and probably Brian) to Switzerland during their marital crisis ("Aunt Nauseum"). According to Helen, Rita was their mother's favorite daughter, which has led to strained relations between the sisters. Rita, for her part, denies that she was the favourite and views Helen as working so hard that she made Rita (and Amy) look bad, something she thought Helen was doing deliberately. She views Amy as deliberately avoiding contact with everyone, and views both women as having deliberately ostracised their mother by never contacting her. All three sisters appeared at the same time in the episodes "I Don't" and "Aunt Nauseum"; in the latter, they finally (we hope!) buried their past arguments and made up (thanks to nudging from Daria and Quinn). In another interview, Eichler implied Rita was the type of teeenager "it was very common for the oldest child to get swept up in the social changes of the time [1960s], even maybe losing their footing a bit, whether that meant dropping out of school, becoming a huge druggie, getting into a bunch of bad “all you need is love” relationships, or having any number of other experiences that their parents considered scandalous"; Helen saw that and "pretty far in the other direction, opting for structure, et cetera" (until college, that is). 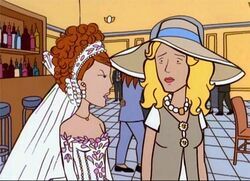 In fanfiction, due to uncertainty surrounding the Barksdale sisters' birth order, Rita was frequently portrayed as younger than Helen (e.g., "Gone," by The Angst Guy). This page was last edited on 4 February 2014, at 08:04.